This is a kind of fine quality car/battery charger, exquisiteness and mini size body design, automatic fast charging, and no occupancy of space in your car, satisfy you all kinds of need. Over voltage protection, over temperature protection, overcharge protection, short circuit protection, reverse connection protection, overcurrent protection, lowcurrent protection. Over voltage protection, over temperature protection, overcharge protection, short circuit protection, reverse connection protection, overcurrent protection, lowcurrent protection. This is a fully automatic battery charger with 3 charge stages, constant current charging, constant voltage charging, float charging. With summer and winter mode, and able to detect the temperature, and it will switch to the appropriate voltage automatically. Equipped with silent cooling fans and aluminum radiator, can extending the service life of this charger. One button to restore and activate, very convenient. Microprocessor Control (CPU) for save and fast charging service for your battery! 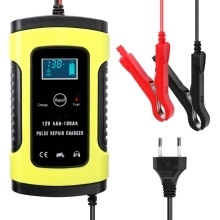 LCD digital display voltage, current, temperature, battery capacity in real time, convenient to read. The outer is made of ABS flame retardant material, insulation, flame retardant, high temperature. Freeze-resistant soft copper core line, with full coverage alligator clip, soild and practical. Pure copper transformer, stable output, high conversion rate, energy saving, large capacity, etc. Automatic charging protects your battery from being overcharged, so you can leave the charger connected to the battery indefinitely. They may also help restore drained and sulphated batteries. Types of batteries: Most types of lead-acid batteries including Calcium, GEL and AGM, Wet, EFB, etc.. Note: Can not be used to charge the lithium battery. Material: ABS, copper, aluminum, etc.